Read what others have to say about Jim's works. Jim Reed is a native of Tuscaloosa and graduate of the University of Alabama. His early career in broadcasting and public relations ended 37 years ago when he founded Reed Books and the Museum of Fond Memories in Downtown Birmingham. Jim's writing career has continued since the age of four. He has published a dozen books and hundreds of stories about his life in Alabama. His weekly columns appear on the internet, as do his audio podcasts. Jim frequently speaks to groups and classes about the joy of writing, the joy of reading, and the joy of not have bosses for 37 years. Reed is married to editor Liz Reed, with whom he has raised three children. Seven grandchildren call him "Poppy." Jim Reed was born in Tuscaloosa, Alabama, in 1941, and has been writing since he was 12. A graduate of the University of Alabama, Reed has worked in radio and television, higher education, and public relations. In 1985, Reed retired his three-piece suit, grew a beard, and recreated his life as author, storyteller, speaker, columnist, humorist, rare book dealer and museum curator. Reed is called upon frequently to share his inspirational view of the world. He speaks on "How To Become Your Own Book" at universities and schools, as well as civic and writing groups. "Small Town Red Clay Tales, Both Actual and True" and "Christmas Comes But Once A Day" are performed in Alabama by the Seasoned Readers, a non-profit troupe of senior actors. Reed has written literally hundreds of true (and actual) stories about life in the Deep South. When not writing, teaching or speaking,Reed can be found in The Museum of Fond Memories at Reed Books, Birmingham, his shop full of old books, posters, toys and other things you wish your mother had not thrown away. Reed is married, the father of three, and "Poppy" to seven grandchildren. Community Affairs Committee (on Race and Racism) of Birmingham. Former co-chair. Film, "The Museum of Fond Memories" written and produced by Memri Williams and Anna Carter in 2015. Appeared as subject of film and interviewee. Film, "Mr. Todd's Fancy" written & directed by Bill Chitwood in 2013. Appeared as on-screen narrator. 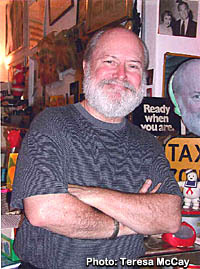 Subject of film documentary, "Reed Books The Museum of Fond Memories" by Larry O. Gay in 2010.